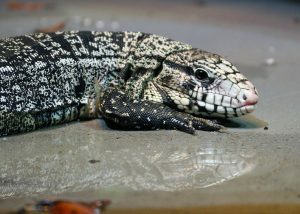 Commonly known as the giant tegu, the Argentine black-and-white tegu is the largest species of tegu lizard. We are going to take a closer look at one of the Greater Cleveland Aquarium’s newest residents and learn about its habitat, diet and even a unique characteristic with aquarist Brenton Maille. 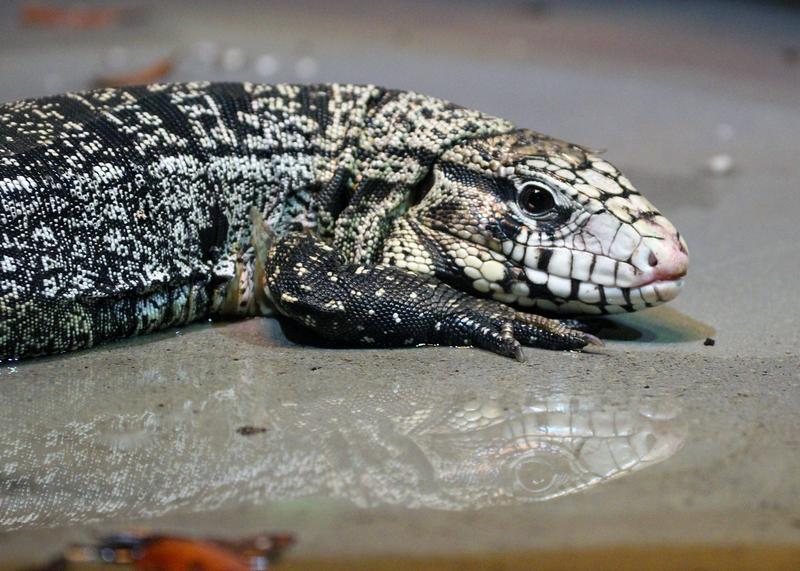 Did you know the Argentine tegu can survive in a range of habitats? From rainforest to scrubland, these tegus utilize the habitats available to them. Because tegus are very adaptable, they have resisted deforestation, which is a very common threat to species in the rainforest. “Tegus utilize different habitats and different areas of those habitats as well,” says Maille. Many people know of this tegu species because it’s considered an invasive species in Florida, meaning it is not native to that area. According to Brenton, it is believed that the Argentine black-and-white tegu may have become invasive to Florida due to the pet trade. While the tegu is tiny and pretty adorable when young, they can eventually reach lengths of up to 4 feet which can be more than some pet owners are ready to handle. “Once a tegu started to get too large for a home environment people would release them into the wild, making them invasive species,” Maille says. So what does a tegu eat? “In the wild, their diet changes throughout their life,” Maille says. When born, they are predators, eating mostly birds’ eggs and small insects. Once tegus get older and grow they switch to mostly omnivorous lifestyles, although they may still occasionally catch small rodents. They are generally good hunters and scavengers in the wild. Most people know that cold-blooded animals rely on outside temperatures to determine their body temperature. While the tegu is an ectotherm, it has the rare ability to raise its own body temperature by about five degrees in certain circumstance. While this is interesting and unique, there must be a reason . . . right? That reason is for breeding season. “Males compete better and females can produce and lay eggs faster,” Maille says. Nature. It’s a curious thing. 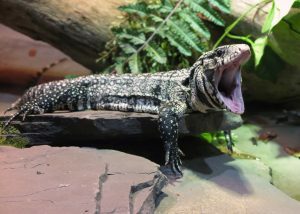 Learn more about the Argentine black and white tegu and other reptiles on your next visit to the Greater Cleveland Aquarium. This colorful, eye-catching fish is a red terror cichlid (Cichlasoma festae). It can grow to lengths of 12 – 20 inches and live somewhere between 12 – 20 years. But what else do we know about it? The red terror cichlid in the Aquarium’s Tropical Forest Gallery is hard to miss. Stop by and see this and many other very different but equally intriguing cichlids at the Greater Cleveland Aquarium. Nature. It’s a curious thing. Nature. It’s a curious thing. To see a spotted turtle and learn about the Splash Fund, Wild4Ever Foundation and Terrestrial Brewing Company‘s “I Love It When I Save the Turtle Porter, visit the Greater Cleveland Aquarium’s Ohio Lakes & Rivers Gallery. Nature. It’s a curious thing. You can see a GPO at the Greater Cleveland Aquarium—but you may really have to look to find him. Did you know that the coloration of a frilled lizard depends on where it lives? Fortunately I had the opportunity to talk to Bethany Hickey, a Greater Cleveland Aquarium Aquarist, to learn all about one of the aquarium’s newest residents. Check out the video below, and come visit the Greater Cleveland Aquarium to see the frilled lizard for yourself… if you can spot it! Nature. It’s a curious thing. It’s that time of year again—Fin Fest! Sharks are already on our minds 24/7, but this week-long celebration of sharks (July 22 – 29, 2018) gives us an excuse to really show how much we appreciate these jaw-some animals. Of the three shark species in the Shark Gallery, sandtiger sharks are often the first ones you notice and the ones you remember long after you visit for a number of reasons. They tend to cruise around near the water’s surface, positioning themselves above the nurse and sandbar sharks at the top of the gallery’s vertical hierarchy. The aesthetics, too, are enough to drop a few jaws. Row upon row of ragged, razor-sharp teeth reveal themselves even while the shark’s mouth is at rest, lending an aggressive edge to an already imposing body that can grow to 10½ feet and more than 350 pounds. The sandtiger shark is also the only shark species that exhibits a certain hunting behavior: They are known to swim to the surface and gulp air into their stomachs, giving their bodies more buoyancy. This enables them to hover in the water with ease and stalk their prey by remaining completely motionless until the right time to strike. So, while they may not be the most aggressive swimmers or the most ravenous eaters, but when the time comes to feed they can put all those teeth to good use. It doesn’t take long to find a sandtiger shark on a typical visit to the Aquarium. Their awe-inspiring stature and protruding rows of teeth catch the eyes of guests almost immediately as they enter the shark gallery. Popik agrees that their appearance combined with their behavior gives them an air of quiet dignity. “They have a presence in the exhibit,” he says. “The way they just cruise around; you can tell nothing bothers them.” Indeed, simply watching a sandtiger glide by or even overhead in the sea tube inspires a sense of respect for ocean life few other creatures can match. Also known as the “brown shark” due to their muddy-gray appearance, the sandbar shark is most commonly found in shallow coastal waters with a population distribution that touches every continent except Antarctica. Despite being prevalent on an international scale, some of the largest groups of sandbars can be found relatively close to Northeast Ohio. In fact, they’re the most common species of shark in the western Atlantic Ocean. Large nursery grounds in the Chesapeake Bay, Delaware Bay and in parts of the Carolina coast make them a very common shark species around popular beach vacation spots for Clevelanders. Their population in these areas takes a huge hit in the winter, however, as their migration patterns take them as far south as the Gulf of Mexico in search of warmer water. Showing off their athletic swimming ability and undeniably cool appearance, sandbar sharks don’t just bridge the gap between the nurse and sandtiger — they’re proof that even the most common shark species are something truly extraordinary. It’s that time of year again! Fin Fest is only a few weeks away, and we can’t wait to welcome shark lovers of all ages to the Aquarium to celebrate with us. Sharks are already on our minds 24/7, but Fin Fest gives us an excuse to really show how much we appreciate these jaw-some animals. This week we’re covering the nurse shark, the sedentary bottom-dweller that can be found hanging around the lower, more secluded areas of the shark gallery. There are a few theories on how nurse sharks got their unusual common name. Most agree that it comes from the old English word “hurse,” meaning “seafloor shark,” but others argue the name was inspired by the sound they make while hunting which is often compared to a nursing baby. Hanging out in the lower regions of their exhibit, the calm-and-collected nurse shark shows us how varied shark behavior can be in nature. Next week we’ll be talking about the sandbar shark, whose agile swimming and striking silhouette make it one of the most fun to watch animals here at the Aquarium — and don’t forget, Fin Fest is happening right here every day from July 22nd through the 29th. If you love sharks as much as we do, it’s the place to be, so don’t miss out. We’re gearing up for Father’s Day, which made me think about the many different kinds of “wild” dads there are here at the Aquarium. While they’re all deserving of our appreciation, none go above and beyond quite like seahorses and weedy seadragons. When these species reproduce, it’s the male who nurtures the developing embryos and carries them to term. In short, pregnant dads! Really makes you rethink gender roles, doesn’t it? This unique reproductive method is exclusive to the family Syngnathidae, which also includes pipefish and pipehorses. Some other things all syngnathids have in common are fused jaws, the absence of pelvic fins and thick, bony armor covering their bodies — but male pregnancy, in terms of pure “wow” factor, is their main calling card as a group of species. The female deposits the unfertilized eggs with the male, who then cares for the growing embryos until they’re born. However, no two syngnathids share the exact same reproductive process. This includes our seahorses and seadragons, who differ in a couple of interesting ways. First of all, the seadragon and the seahorse carry fertilized eggs in different locations. A pregnant seahorse looks pretty familiar to us humans, as they carry their young (who often number in the thousands, by the way) in a pouch located in their abdominal area. This gives them a sort of potbelly appearance. Seadragons, on the other hand, carry their eggs on a specialized patch of skin at the base of their tails. The hatching processes of the two species are also completely different. Seahorses’ brood pouches begin to expand right before they give birth. This happens as the fully-grown seahorse embryos begin to hatch from their egg membranes and move freely around the pouch. Once the pouch is at capacity, the seahorse finally gives birth, releasing the entire brood at once in dramatic fashion. Meanwhile, seadragons give birth to their brood more slowly over a period of several days. The baby seadragons hatch one by one rather than all at the same time, decreasing the competition for food by dispersing the brood over a larger area of ocean. You could say seadragon dads go the extra mile to set their kids up for survival in the wild, however, it doesn’t look as impressive in captivity. If you want to see these amazing aquatic parents up close, come visit us at the Greater Cleveland Aquarium in the First Energy Powerhouse on the West Bank of the Flats. Bring your own dry-land dad on Father’s Day, June 17th, and he’ll get in free with the price of a general admission ticket — find out more here.